The word "trinity" is not found anywhere in the Bible. So does that mean it is a false teaching? Throughout the years, there have been many errors regarding the triune nature of God, and many of those errors still persist today. I will not attempt to define or elaborate here on the erroneous teachings. But I would like to show you what the Bible says about the Trinity. The thirtieth proverb says, "Neither have I learned wisdom, Nor do I have the knowledge of the Holy One. Who has ascended into heaven and descended? Who has gathered the wind in His fists? Who has wrapped the waters in His garment? Who has established all the ends of the earth? What is His name or His son's name? Surely you know!" (Pro 30:3-4) I would like to ask you, my dear reader, to tell me the name of the Son of the One who established all the ends of the earth. Surely you know! The answer to that question is found in the following verse, which says, "Every Word of God is flawless..." (Prov 30:5a, NIV). His name is "the Word of God." I will elaborate on this title more in the following section, but I would also like to point out that another hint for the answer to the question, "What is His Name or His Son's name" is found in the first verse of this proverb that says, " The man declares to Ithiel, to Ithiel and Ucal..." (Prov 30:1b, NASB). According to Matthew Henry, "Ithiel signifies God with me, the application of Immanuel, God with us...Ucal signifies the Mighty One." I will also elaborate further on these two titles in the following section. In the other seventeen instances where the Hebrew word “El” is used in Isaiah, it always means the one, true, holy and righteous God of Israel, the LORD, Who created the heavens and stretched them out, Who spread out the earth and its offspring, Who gives breath to the people on it And spirit to those who walk in it. The Lord calls Himself “El.” (see Isa 43:12; 45:22). So I ask you, my friend, to whom does the term “us” refer in this passage, where it says, “a child is born to us” and “a Son will be given to us”? Is it the prophet and his wife? Is it the nation of Israel? Who do you think had a Son called “El Gibbor”? Only One Person is worthy of that name, and that is the Son of God Himself. Jesus Christ is the “God-Man,” the “Mighty God!” So the term “Us” in this passage refers to the triune God-head, just as Elohim spoke in the first person plural at the creation, saying, “Let Us make man in our own image.” (Gen 1:26). Another passage that illustrates my point is a tribute to the Messiah found in Psalm 45. It says, "Your throne, O God, is forever and ever; A scepter of uprightness is the scepter of Your kingdom. You have loved righteousness and hated wickedness; Therefore God, Your God, has anointed You with the oil of joy above Your fellows." (Psa 45:6-7; cf. Heb 1:9). According to Hebrews 1:8, the psalmist addresses the Son, saying, "Your throne, O God, is forever and ever." And in the next verse the psalmist says to the Son, "Therefore God, Your God, has anointed You." He is speaking to the Son saying, "O God...God, your God has anointed you." This could only be true of Jesus Christ, who is God, and whose God is the one, true God. Prior to His becoming flesh, Jesus, the Word was with God at the dawn of creation. "In the beginning was the Word, and the Word was with God, and the Word was God. He was in the beginning with God...And the Word became flesh, and dwelt among us, and we saw His glory, glory as of the only begotten from the Father, full of grace and truth.” (Joh 1:1-2, 14). The Word was God! We learn from the Revelation given to the apostle John that "He is dressed in a robe dipped in blood, and His name is the Word of God." (Rev 19:13, NIV). And, of course, the term “us” in Isaiah 9:6 referred in part to Joseph and Mary, the earthly parents of Jesus. "BEHOLD, THE VIRGIN SHALL BE WITH CHILD AND SHALL BEAR A SON, AND THEY SHALL CALL HIS NAME IMMANUEL," which translated, means, "GOD WITH US." (Mat 1:23). The Lord Jesus Christ is "God with us" to all of us who believe in Him. Jesus is the exact representation of God's nature. While man is made in God's image, Jesus is the actual image of God. The original Greek word for “image” here is eikon, from which we get the English word icon. It means, “a likeness, that is, (literally) statue, profile, or (figuratively) representation, resemblance: image.” If you want to know what God looks like, just look at Jesus. He takes after His Father, and resembles Him exactly. Not only is Jesus the image of God, He also sits at God's right hand, in the place of highest honor and power and authority, ruling the universe. The Bible teaches that Jesus will present the saints to the Father, making us to stand in His presence blameless, because of His atonement. The object of this sentence is "the only God our Savior," whom Jude refers to as "Him." When Jude gives glory to "Him," the only God, he is referring to the Father in heaven. We know this for certain, because Jude says that we give this glory to God "through Jesus Christ our Lord." We give the glory "to" God, and we do so "through" Jesus Christ our Lord. This shows a clear distinction between the Father and the Son. And it is in agreement with the words of Jesus Himself, who said, "no man comes to the father except by Me." (Jn 14:6). Jesus also said, "Therefore everyone who confesses Me before men, I will also confess him before My Father who is in heaven. But whoever denies Me before men, I will also deny him before My Father who is in heaven." (Mat 10:32-33). All of these verses together indicate that Jesus will one day present us in the Father's glorious presence and confess us before Him. "Grace, mercy and peace will be with us, from God the Father and from Jesus Christ, the Son of the Father, in truth and love." (2Jo 1:3). The use of the conjunction "and" here indicates two distinct Persons. Jesus Himself indicated that while He was one with the Father, He was distinct from the Father. He prayed, "This is eternal life, that they may know You, the only true God, and Jesus Christ whom You have sent." (Joh 17:3). Eternal life is knowing the the Father in heaven, only true God, and Jesus Christ. The One "Who is and Who was and Who is to come"
As I have just proven, the Father and Jesus are distinct Persons. This is very clearly evident throughout the entire book of Revelation, including John's greeting, which makes explicit reference to the Trinity. He writes: "John to the seven churches that are in Asia: Grace to you and peace, from Him who is and who was and who is to come, and from the seven Spirits who are before His throne, and from Jesus Christ, the faithful witness, the firstborn of the dead, and the ruler of the kings of the earth. To Him who loves us and released us from our sins by His blood--" (Rev 1:4-5). Here John conveys a blessing of grace and peace to the seven churches in Asia. The grace and peace are from 1) The Father, whom he refers to as "Him who is and who was and who is to come," 2) "and from the seven Spirits who are before His throne," which explicitly refers to the Spirit of God, 3) "and from Jesus Christ." Each of these references are separated by the word "and" (Greek: "kai"), indicating that they are each distinct. If they were not distinct Persons, then it would make no sense for John to use this expression the way he did. Therefore, it seems quite clear to me that the Father is the One Who identifies Himself by declaring, "I am the Alpha and the Omega," says the Lord God, "who is and who was and who is to come, the Almighty." (Rev 1:8). He refers to Himself as "the Almighty," and John refers to Him as "the Lord God." This is consistent with the distinction made throughout the book of Revelation, where only the Father is referred to as "God," or "the Almighty," or "the Lord God Almighty," and Jesus is referred to as "Christ," "the Son of God," "the Word of God," "the Lamb" and "The Amen, the faithful and true Witness, the Beginning of the creation of God." (Rev. 1:1,2,6,8,9; 2:7,18; 3:1,2,12,14; 4:5,8,11; 5:6,9,10; 6:9; 7:2,3,10,11,12,15,17; 8:2,4; 9:4,13; 10:7; 11:1,11,13,16,17,19; 12:5,6,10,17; 13:6; 14:4,7,10,12,19; 15:1,2,3,7,8; 16:1,7,9,11,14,19,21; 17:17; 18:5,8,20; 19:1,4,5,6,9,10,13,15,17; 20:4,6; 21:2,3,7,10,11,22,23; 22:1,3,5,6,9,18,19). The term Alpha and Omega means First and Last, just as the letters alpha and omega are the first and last letters of the Greek alphabet. The term "first" comes from the Greek word, protos, meaning – foremost (in time, place, order, or importance); before, beginning, best, chief, first (of all), former. The term "last" comes from the Greek word, eschatos, meaning – farthest, final, end, lowest, uttermost. Jesus refers to Himself as the Alpha and Omega. Not only does He exist now, but He was and He is to come. Jesus is the beginning and the end. Jesus took the lowest place. He became the lowest during his passion and crucifixion. He was farthest from God when He prayed, “My God, My God, why have You forsaken Me?” No one has ever been farther from God than Jesus was. Now He is in the highest place! (see Phil 2:5-11). He declares the end from the beginning (see Is 46:10). He is exalted above all else! One of the most interesting things to me about the Godhead is that Jesus calls Father “My God.” That's right! Even Jesus, Who is Himself God, has a God -- the one true God, which His Father. About the ninth hour Jesus cried out with a loud voice, saying, "Eli, Eli, lama sabachthani?" that is, "My God, My God, why have you forsaken Me?" (Mat 27:46). There are many passages that show the beautiful relationship that Jesus and the Father have with each other. And He went a little beyond them, and fell on His face and prayed, saying, "My Father, if it is possible, let this cup pass from Me; yet not as I will, but as You will." (Mat 26:39) If Jesus and the Father were the same person, the this prayer would not make any sense. Jesus would have said, "Not as I will, but as I will." However, their wills are separate and distinct from one another, which indicates two persons. Something else I find fascinating is that the Father knows things that Jesus does not. For example, the Father knows the day and the hour when Jesus will come back to the earth. But Jesus does not know. Jesus said, "But of that day and hour no one knows, not even the angels of heaven, nor the Son, but the Father alone." (Mat 24:36). The book of Revelation begins with the words, "The Revelation of Jesus Christ, which God gave Him to show to His bond-servants, the things which must soon take place; and He sent and communicated it by His angel to His bond-servant John," (Rev 1:1). Put differently, God gave this revelation to Jesus Christ. If God had to give the revelation to Jesus Christ, then the Father is the source of the revelation. Just as Jesus only said what He heard the Father saying during his earthly ministry, in the same way after his resurrection and ascension, He received a revelation from the Father, which He delivered to the saints. If Jesus was praying to Himself, why would He lift His eyes to heaven and address God as "Father?" And His prayer was for the Father to glorify Him, so that He may glorify the Father. Again, this prayer would not make any sense if Jesus were praying to Himself. He would have to say, "I now glorify myself, so that I may glorify Myself." When Jesus was asked by His disciples how to pray, He taught them and us to pray to the Father in Heaven. Jesus taught us to pray to the Father in Jesus' name. Consider this fact in relation to the distinction between the members of the Godhead. It is consistent with the evidence throughout Scripture that the Father and Jesus Christ are two distinct Persons. If the Father were Jesus, there would be no need to give Himself authority. Likewise, there would be no need to give Himself the disciples, as Jesus said in this prayer the Father had done: "to all whom You have given Him, He may give eternal life." As I mentioned already, Jude referred to God the Father as the only God our Savior (Jud 1:25). This is consistent with the Scriptures written before Christ, in which God was referred to as Savior (2Sa. 22:3; Psa. 17:7; 106:21; Isa. 19:20; 43:3,11; 45:15,21; 49:26; 60:16; 63:8; Jer. 14:8; Hos. 13:4). Jesus prayed to the Father, saying, "I have manifested Your name to the men whom You gave Me out of the world; they were Yours and You gave them to Me, and they have kept Your word. (Joh 17:6). What name did Jesus manifest? He manifested or displayed the name of the Father, which is the same as His name, Jesus. Jesus also equated Himself with the "I AM" title God gave Himself in Exodus 3:14, when "Jesus said to them, 'Truly, truly, I say to you, before Abraham was born, I AM.'" (Joh 8:58). In Hebrew, this name that we translate "I AM" in English is "YHWH," the tetragrammaton for Yahweh, meaning approximately "he causes to be" or "he creates". The Hebrews understood the holiness of this name, and did not write it out in full, preferring to use only the four consonants. Rather than pronounce it, they preferred to say instead, "the Lord." These passages and others make it clear that the Father and Jesus have the same name, as well as the same title. It is part of the ancient Hebrew culture for a son to be named after his father, which is why it was so surprising to everyone when Zechariah named his son John (Lk 1:59-63). We still do the same thing today, naming sons after their father. The son always carries the father's family name, or surname. For example, I have the same "Lacroix" name as my father, which is French for "The Cross." And sometimes a son also carries the father's given name. For example, a father named "Charles" sometimes names his son, "Charles." The heavenly Father did this when He named His Son Jesus. However, having the same name does not mean they are the same person. For more on this topic, see The Name of Jesus. The Word of God is full of references to the Spirit of God. In the Old Testament, He was called the ruach, meaning "wind" or "breath. In the New Testament, He is called the pneuma, meaning "spirit," "current of air" or "breath." The Old Testament revealed long ago that not only is God the Father, He also has a Spirit. There are many other Scriptures in the Old Testament about the Spirit of God. But here are just a few examples: Is 11:1-2; 61:1; 42:1; Ps 51:11; Ez 11:1. The prophet Isaiah prophesied that the Spirit of the Lord would be upon Messiah. King David asked the Lord not to take the Holy Spirit from him. The prophets, like Ezekiel, said the Spirit lifted them up. Now let's look at some from the New Testament. For more on this, see The Person of the Holy Spirit. Even in the Old Testament book of Joel, the prophet foretold the outpouring of the Spirit that would happen in these last days. For more about the fulfillment of this prophetic promise, see Baptized with the Spirit. We know there is only one Holy Spirit, since He is referred to in the singular form throughout Scripture, including the book of Revelation. Yet another very amazing aspect of God is that the Holy Spirit is sometimes referred to as the seven-fold Spirit, which is sometimes translated as "the seven Spirits of God." Moses wrote in the Hebrew shama, "Hear, O Israel: The Lord our God, the Lord is one [echad]." (Deuteronomy 6:4). In this passage of Scripture, Moses used the Hebrew word "echad" for "one" when he referred to God's oneness. This is the same Hebrew word used for a unified oneness between two people in Genesis 2:24, in which Moses wrote, "That is why a man leaves his father and mother and is united to his wife, and they become one [echad] flesh." We also find the same Hebrew word "echad" used throughout the Hebrew Scriptures for plural oneness, such as "one people" (Gen 11:6; 34:16,22), "one heart" (2 Chr 30:12; Jer 32:39), and forming "one stick" by joining two (Ez 37:17). First of all, when Jesus was baptized, we see all three Persons of the Godhead manifested at once. Luke wrote in his gospel: "Now when all the people were baptized, Jesus was also baptized, and while He was praying, heaven was opened, and the Holy Spirit descended upon Him in bodily form like a dove, and a voice came out of heaven, 'You are My beloved Son, in You I am well-pleased.'" (Luk 3:21-22). Jesus was in the water praying to the Father, who was in heaven speaking to Jesus about how pleased He was with His Son, and the Holy Spirit was descending upon Jesus in bodily form. This is undeniable evidence that the three Persons of the Godhead co-exist simultaneously. They are not three manifestations of God that occurred at different points in time. Each of these passages above refers to the three members of the Trinity separately yet concurrently (cf., Joh 14:16, 26; 15:26). This revelation was given to John Bunyan by Elijah in heaven. Both the Old and the New Testament Scriptures clearly teach that the Divine Godhead is a Holy Trinity, although the term "trinity" is never used in the Bible. Surely the eternal God is One God. As Moses taught, "Hear, O Israel! The LORD is our God, the LORD is one!" (Deu 6:4). We are strictly monotheists. Nevertheless, He is one Triune God in perfect unity of three Persons -- the Father, the Son, and the Holy Spirit. In fact, many times the three Persons of the Trinity are referred to concurrently in Scripture. They are simultaneous and co-eternal. Therefore, we should not reject the doctrine of the Holy Trinity, as if it were a form of tritheism. On the contrary, we should guard against error regarding the Holy Trinity, and believe the truth of God's Word. Jesus is not only the Son of God, He IS God! He is the exact representation of God, the perfect image of God. He sits at right hand of God, reigning in majesty on His throne, and calls the Father “My God”. The heavenly Father and Jesus Christ are distinct Persons. One day, Jesus will present his bondservants to the Father. And just as He prays to the Father, He taught us to pray to the Father as well. It's the Father who gives the Spirit in the name of Jesus. And the Holy Spirit is being poured out in these last days, just as the Father promised. Attribution notice: Most Scripture quotations taken from the NASB. 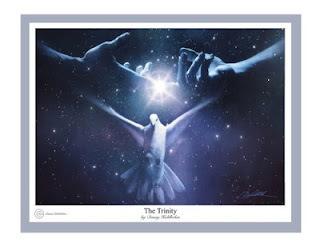 The "Trinity" painting © 2012 Danny Hahlbohm, all rights reserved by the artist. You can access my complete blog directory at "Writing for the Master." Now I'd like to ask a very important question.